It’s time to start the school year off on the right foot with these 20+ ways to make the first day of school special. Changing routines, starting a new year, and possibly even a new school for some of your kiddos can be so very stressful! I’m here to make it fun! There are so many ways to make the first day of school special, from writing a note, making special cookies, and even going on a scavenger hunt! Create a solid foundation from the very start of the year with some simple and fun ideas. 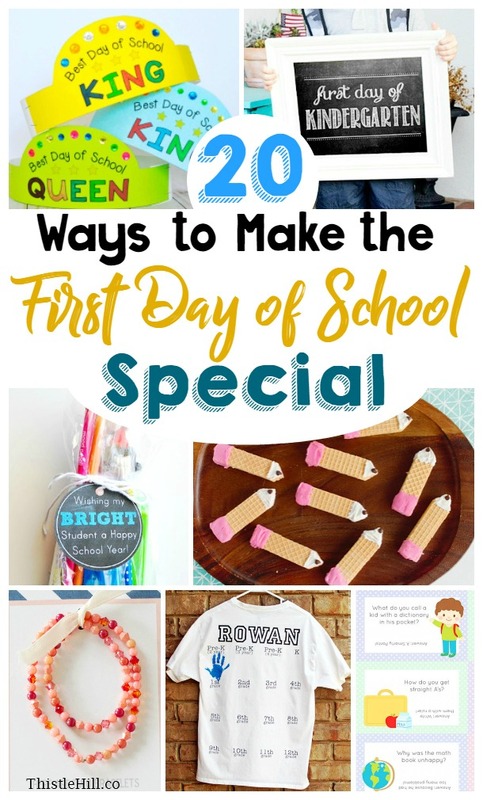 As I find more fantastic ways to make the first day of school special, I will be adding more and more ideas for you to enjoy! We now have over 20 and counting! Enjoy! Back to School Lunch Box Jokes and Notes Printable: Get those kiddos giggling! Lunch Box Jokes: Because you can never have enough giggles! Here are some more clever (and FREE) printable lunch box jokes! You could easily use these throughout the entire school year. “Donut” Sandwich Lunch: What kid doesn’t like a donut?!? Back to School Wafer Pencil Cookies: Easy, adorable, and delicious! Yearly Back to School Shirt with Handprints: Fantastic way to start a school year tradition. DIY Back to School Time Capsule: Keep the kids busy while giving them something to look forward to. Printable First Day of School Scavenger Hunt: Fantastic idea! First Day of School Mom and Me Bracelets: Great way to stay connected. You could also use the Heart Trick! First Day of School Photo Ideas: Wonderful 1st day of school photo ideas! First Day of School Chalkboard Printable Signs: Photo props! Back to School Confetti: Way to make back to school fun! Back to School Gift with Printable Tags: Give your kiddos a small gift before school starts. Waffles After School Pencil Snack: This would also make a cute back to school breakfast. Read and Make Jitter Juice: Too cute! Make a Pencil Banner with Your Child’s Name: Another fantastic way to get those kiddos excited about the school year. DIY Back to School Photo Frame: Capture that 1st day of school photos and frame them with this cute photo frame. Back to School Notebook Pages Cupcakes: After school treat! Schultute – German School Cone Gift: Check out this tradition! I had no idea! Special Back to School Dinner: Celebrate the first day of school with this yummy meal. Printable Back to School Crowns: Make your kiddos feel like royalty with their own back to school crowns. All of my kids (3 boys!) have always had a hard time starting the school year. It’s never easy, but there sure are some great ways to make the first day of school exciting. You can also find even more ideas over on my other post, How to Calm the First Day Jitters of School. How do you make the first day of school special? Share what has worked for you and your kiddos in the comments! Good luck fellow parents!